Always find this pub clean and tidy it`s just outside Guildford so away from the hustle of the town. They had 2 ales on last visit which where fine. 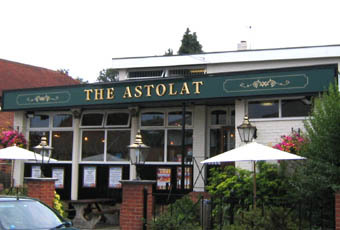 The Astolat is actually a very nice pub despite the low rating it's received here. However, the pub is clean, tidy, has a darts board, a pool table, lots of TVs and the staff are all really friendly! Recently the pub has loaned it's kitchen to an Indian Restaurant, which to be fair is a great plan (Curry AND beer!? hell yes!). Had a decent refurb about 4 months ago. Much nicer place to spend time than it was, and there are usually 3 real ales on at any one time, which are kept well. Worth a return visit if you remember it as it was. This is the definition of 'it's not a bad place' which also says it's not an entirely good place either. If you're in the area you can do a lot worse. The staff seem professional and there was a pool table if i remember correctly. My only criticism is that I felt sick the following day. I blame it on the packet of crisps between the seventeenth and eighteenth pint. Ok if in the area, standard beer range.